The tension between Alaska Governor Sarah Palin and top McCain campaign aides in the closing days of last fall's presidential campaign is elucidated in a profile in the new issue of Vanity Fair. CBS News' Scott Conroy and special contributor Shushannah Walshe, who are writing a book about Palin, reveal just one example of how the mutual frustrations went even further than what has been disclosed so far. Internal campaign e-mails exchanged three weeks before Election Day offer a rare look at just how frustrated then Republican vice presidential nominee Sarah Palin had become with the manner in which top McCain campaign aides were handling her candidacy. The e-mails, obtained exclusively, also highlight the power struggle and thinly veiled acrimony that pervaded the relationship between Palin and the campaign's chief strategist, Steve Schmidt. The episode in question began when an investigative report published on the left-leaning Web site Salon.com raised questions about Palin's relationship with members of the Alaska Independence Party (AIP) when she was mayor of Wasilla. The AIP's platform calls for a vote giving Alaskans the option to secede from the United States. It had already been widely known that Todd Palin was a registered member of the AIP from 1995 to 2002 and that Governor Palin had taped a recorded greeting at the party's 2008 convention. On the morning of Oct. 15, Palin was aboard her campaign jet and en route to New Hampshire when she happened to catch a disparaging CNN segment that touted the Salon.com story, complete with a provocative graphic at the bottom of the screen reading, "THE PALINS AND THE FRINGE." While shaking hands after a rally later that afternoon, someone on the rope line shouted a remark at Palin about the AIP. The comment set her off. She worried that the campaign was not sufficiently mitigating the issue of her alleged connection to the party, which despite a platform that harkens more to the Civil War than the 21st century, continued to play a serious role in Alaska politics. Palin blasted out an e-mail with the subject line "Todd" to Schmidt, campaign manager Rick Davis and senior advisor Nicolle Wallace, copying her husband on the message (all of the e-mails are reprinted below as written). Her reference to a single protestor's sign and "many shout-outs" was indicative of Palin's occasional tendency to take anecdotal evidence of a minor problem and extrapolate it into something far more menacing. The final of the three presidential debates was just hours away, which would mark the unveiling of the soon-to-be canonized Joe The Plumber. The Joe The Plumber narrative was the Republicans' secret weapon -- the last chance to put a chink in Obama's seemingly impervious armor. It was not a time for distractions, but the campaign was compelled to deal with the drama that seemed to follow Palin wherever she went. Schmidt hit "reply to all" less than five minutes after Palin's e-mail was sent. "Ignore it," he wrote. "He was a member of the aip? My understanding is yes. That is part of their platform. Do not engage the protestors. If a reporter asks say it is ridiculous. Todd loves america." This clear cut response from the campaign's top dog carried an air of finality, but it did not satisfy Palin. She responded with another e-mail, adding five more names to the "cc" box, all of whom traveled on her campaign plane. They included her senior political adviser Tucker Eskew, senior aide Jason Recher, the lone traveling aide from her Alaska office Kris Perry, press secretary Tracey Schmitt and personal assistant Bexie Nobles. Palin's insertion of the five additional staffers in the e-mail chain was an apparent attempt to rally her own troops in the face of a decision from the commanding general with which she disagreed. Her inclusion of her personal assistant was particularly telling about her quest for affirmation and support in numbers, since the young staffer was not in a position to have any input on campaign strategy. Palin was attempting to bend the facts ever so slightly to fit neatly into her version of events. In truth, the box that Alaskans have the option of checking when registering to vote states the full name of the party, "Alaskan Independence Party," not "Alaska Independent," which would make an error by uncommitted voters more plausible. Clearly irritated by what he saw as Palin's attempt to mislead her own campaign and apparently determined to demonstrate that the ultimate authority rested with him, Schmidt put the matter to rest once and for all with a longer response to everyone in the e-mail chain. We will not put out a statement and inflame this and create a situation where john has to adress this." Schmidt's rebuttal to Palin's suggestion that reporters had asked her about the issue was particularly blunt in that it implicitly questioned her truthfulness. Furthermore, his unwillingness to budge an inch on the matter was a remarkable assertion of his power to pull rank over the candidate herself. Palin was silent after his second e-mail and the campaign did not issue the statement she demanded. Reached on his cell phone on Wednesday, Schmidt declined to comment on the e-mail exchange. "I was proud to work for the McCain-Palin ticket," he said. "We did our best in an extraordinarily difficult year. I wish that all this stuff could all be left in the past where it belongs because Barack Obama won the election and he's President of the United States. It's all over, it's in the past." Jason Recher, who remains a staunch Palin supporter and recently accompanied the governor on a trip to New York, said he hoped people would focus more on positive memories from the campaign. "These internal communications and debates are in reference to a campaign that no longer exists," Recher said. "It proves wrong the anonymous claims that Governor Palin didn't seek or follow counsel from senior strategists on a wide array of issues. Sarah Palin has moved on with her life and continues to have a positive impact on so many. We should follow her lead and do the same." Since Election Day, Palin has made only infrequent jaunts to the Lower 48 and has no public plans to cross the political Rubicon into Iowa or New Hampshire. But her oftentimes dysfunctional campaign experience does not seem to have swayed her from seeking national office. In a recent interview with "Runner's World" magazine, the avid long distance runner was asked if there was a part of her that would have been reluctant to leave behind the Alaskan landscape and move to Washington, D.C., had the outcome in November been different. Notably, Palin did not use the past tense in her response. She was instead rather blunt in acknowledging that a future move to the nation's capital is something she can envision. "Alaska would be hard to give up because it is such a part of who I am. 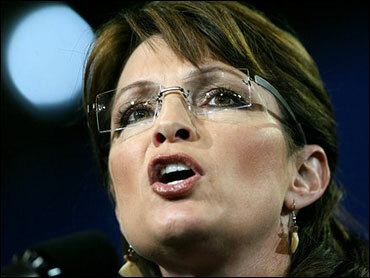 So much of my life revolves around the great outdoors that that would be kind of tough," Palin said. "But on the other hand, I think of being in D.C. and in a position to promote physical fitness and the benefits of making good decisions health-wise and being an example to others, and I know that could do some good for our country."